Tuberous begonias offer interest and full, colorful flowers to your home garden, but they also come with vulnerability to rot problems. Cultural and maintenance issues have a twofold effect. In conjunction with the diminished health of your tuberous begonia plants, these easy-to-fix care problems create a prime environment for the attraction and development of fungal infections that lead to severe stem and root rot. Whether due to improper cultivation or disease pathogens, focused treatment gives you the tools you need to grow healthy tuberous begonias. Plant your tuberous begonias just below the soil line, because planting too deep can easily lead to rot. Water your begonias during morning hours to allow for a full day of sun and time for moisture to dry. Only water when the soil starts to dry out, to prevent overwatering. Waterlogged soil inhibits plants from normal nutrient and water uptake, and wet foliage leads to rot and extreme moisture invites and encourages fungi proliferation. Grow your begonias in locations that offer dappled midday sun, according to the University of Minnesota Extension Service. Avoid full, direct sunlight unless during the early morning or evening hours, as this can dry out tuberous begonias, leading to diminished health and heightened vulnerability to disease and rot. Avoid shaded conditions that prevent dew and irrigation from drying. Sanitize your planting medium or soil to eradicate soil-borne fungi by steaming it for 30 minutes at 140 degrees Fahrenheit, recommend the experts from the University of California IPM Online. Prune and destroy affected plant parts like browning flowers to inhibit the potential for the onset of rot. Apply a fungicide for your particular rot problem if caused by a fungal infection. Pythium root rot, for example, is treatable by fungicides with the active ingredient mefenoxam or fosetyl-Al, according to the University of California IPM Online. Contact your local county extension agent or a licensed professional to set up a chemical control program tailored to your begonia rot problem. Remove and destroy your entire tuberous begonia plant if rot has progressed to the point that your plant has extreme decay, as fungicides and other treatments cannot cure such damage. Avoid replanting with another tuberous begonia that will likely lead to reinfection. Identify potential resistant plant varieties for replanting if you suspect fungal infection as the cause of rot. Wear gardening gloves when handling plants and sharp tools to prevent injury. 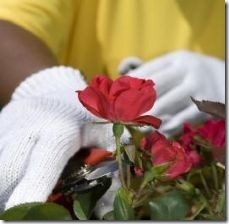 Sanitize pruning shears between each cut and from one plant to the next to prevent the spread of disease. « Are Begonias Poisonous for Birds?